McWay Falls is a beautiful and remarkable waterfall dropping into an untouched cove on the California coast. McWay Falls is the star of Julia Pfeiffer Burns State Park in Big Sur. The way McWay Falls drops to the beach, it looks like paradise. In years past, the 80-foot waterfall landed right in the ocean. A 1983 landslide deposited sand at the base of the waterfall and created the sandy cove seen today beside McWay Falls. Now McWay Falls only kisses the ocean when high tide waves roll ashore. Because it is capable of spilling right into the ocean, McWay Falls can be categorized as a "tidefalls," making it a rare attraction. McWay Falls gets its name from Christopher McWay, an early pioneer in Big Sur. McWay Falls is on the west side of Highway 1, across from most of Julia Pfeiffer Burns State Park. You can pull into the park to see more beauty (like Canyon Falls in the creek above McWay Falls). If you can't stay long, find a parking space along the highway and walk 0.3 miles down McWay Waterfall Trail. 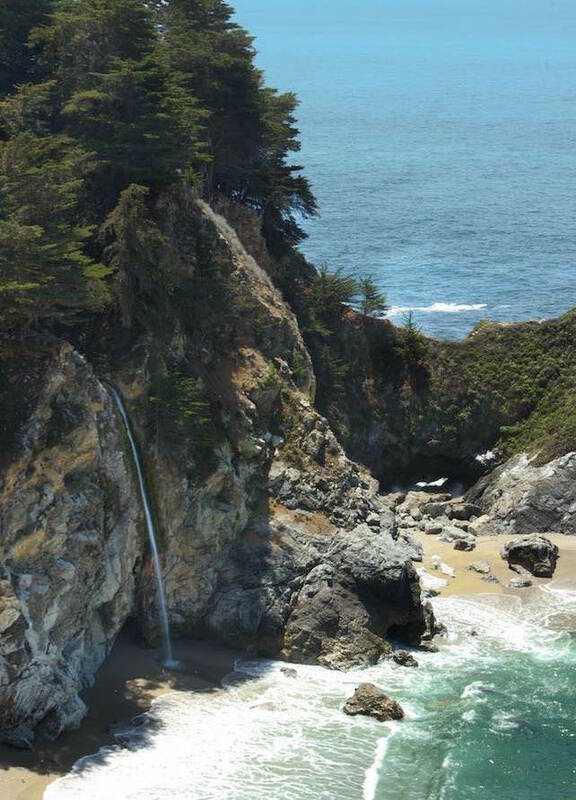 An overlook is perched above the ocean at trail's end, delivering a breathtaking perspective of McWay Falls. It is such a beautiful sight, you won't want to leave. 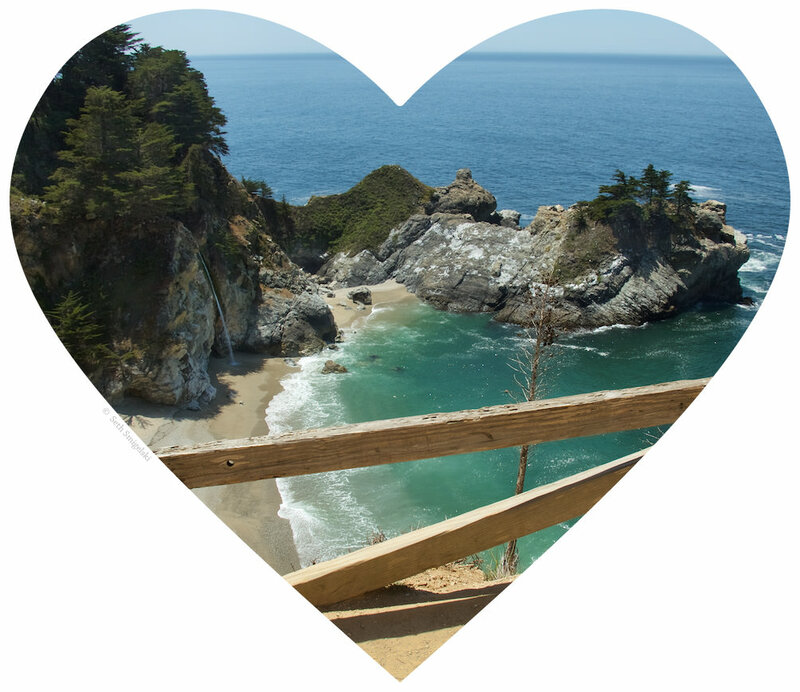 Read more about the McWay Falls Hike! Unless landslides have closed Highway One (it happens), McWay Falls is easy to get to on a drive along the Big Sur Coast. The waterfall is 93 miles north of Highway 101 in San Luis Obispo and 11 miles south of Pfeiffer Big Sur State Park in Big Sur (which has a similar name to Julia Pfeiffer Burns State Park, but is actually a different park (with a fun gorge hike). To experience another postcard-populating perspective in Big Sur, head north to Pfeiffer Beach where a rock island just offshore has a wave-carved tunnel that captivates photographers at sunset. Once you see one waterfall, the rest just flow! Sure you can hike to waterfalls all day, but where will you stay at night? What do other sites say about McWay Falls.